Have you ever felt anxious or stressed out asking for what you want? Does the fear of rejection or looking bad hold you back from landing that sale, asking for a date, or requesting a raise? If so, you are not alone. In 2012, I spoke at NTEN's Nonprofit Technology Conference. While in Washington DC, I stayed with my friends Heather and Neal. Each morning as we were enjoying breakfast together, their 10 year old daughter, Kendall, was a radiant ball of energy, sunshine, and curiosity. However, on my last morning with them, Kendall, was strangely quiet, reserved and melancholy. I asked her, "Kendall, what's going on? Why do you seem different today? Why are you not your cheerful self?" With a sad look, she responded, "Well I am in scouts and I have to go sell cookies today. I don't like doing it because I get rejected most of the time. People tell me they are watching their weight or they already have some or some other excuse." I responded, "Wow, I totally understand. Being rejected doesn't feel good at all." I paused for a moment and asked her, "Hey, how much are a box cookies?" She replied, "They are $4 a box." I reached for my wallet and pulled out a $20 bill, handed it to her, and said "I'll take 5 boxes!" With a surprised look, she asked "Really?" I said "Yes, however I don't eat cookies, so what I would like for you to do is to take each box and give them to 5 different people you’ve never met before." Kendall immediately leaped out of her chair and ran to her mom to share her excitement," Mom, we get to give cookies away!” The transformation in her was amazing. As her excitement settled down, I said "So Kendall, here is why I want you to give the cookies away. I want you to know what it's like to generously give, to see it in people's eye, to feel their genuine appreciation, and to hear that you have made a difference for them. I want you do this 5 times so that you truly know the joys of giving. Then once you do, instead of asking others if they would like to buy some cookies, I'd like you to ask them this. Is there someone in your life you really care about? 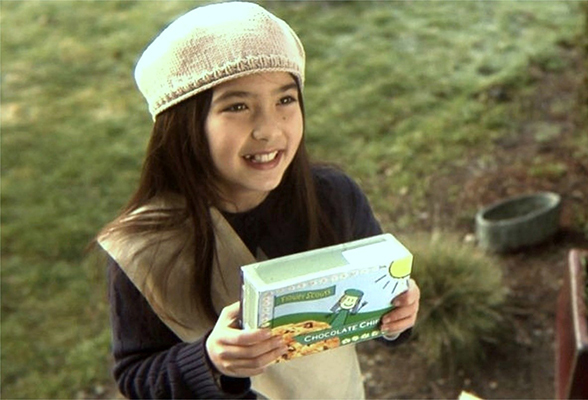 If so, I'd like to help you make their day by giving them a box of cookies." Her eyes lit up with excitement again ready to try out this new approach. How can you create an opportunity for someone else to give that aligns with what you most desire? Most of the stress related to asking for something comes from a fear of judgement and a fear of rejection of who we are. This subconsciously triggers our worst nightmare of losing love, losing respect, and losing belonging, which threatens our survival. Allowing stress like this continue over time impacts our self-esteem, our self-confidence which can lead to burnout. When we reframe a situation, where we become a catalyst of good rather than the subject of consideration, we empower ourselves regardless of the response from others. Whether you are asking for a customer testimonial, asking for help, or asking for a promotion, remember that someone is waiting for your invitation to give.